Working outside in the garden, trimming in your yard or just admiring some flowers this summer. BEE Safety smart. Honey bees, wasp, yellow jackets and hornets are at their peak. Additionally, Africanized Honey Bees (AHBs) in the United States are becoming more and more common, especially in our area of the southwest. First found in southern Texas in 1990, AHBs are now located throughout the south, southeast, and southwest states, including California, and are more likely to attack people and animals near their nests. The danger is that AHBs are more aggressive than EHBs and garden bees. Although the sting from an AHB is no more harmful than one from the common garden bee or EHB, AHBs are known as “killer bees” because they defend their nests more aggressively and attack with less provocation–and in larger numbers. They are more apt to sting quickly and multiple times. Over the last several years, numerous attacks have been reported in California, Arizona, New Mexico, Florida, and Texas, and recently the bees also have appeared in Utah. A Texas man died last week from a bee swarm attack and a landscape worker in Florida was attacked recently by bees while at work cutting grass. Also recently, a worker in Las Vegas was hospitalized after being attacked by a swarm of AHBs while he was operating a backhoe. Emergency response agencies in these states have implemented first responder training programs as well as public education efforts. According to reports, the Africanized (hybrid) bees were created in the mid-1950s when a researcher brought African bees to Brazil and bred them with European honeybees, with the intent to produce hybrid bees that could tolerate tropical environments. These hybrids, along with African queens, were then accidentally released into the wild the next year. The hybrid bees freely interbred with local bees, with the Africanized genetics preferentially retained over time, eventually dominating bee populations. The AHB trait rapidly spread throughout South and Central America, reaching Texas in 1990. 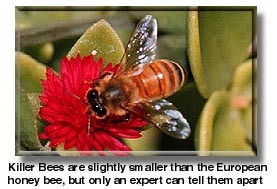 What Are The Differences Between Regular Honey Bees And African Bees ? o Check your property regularly for bee colonies. Honey bees nest in a wide variety of places, especially Africanized honey bees. Look for bees in work areas before using power equipment. Check animal burrows, water meter boxes, overturned flower pots, trees and shrubs. o Keep pets and children indoors when using weed eaters, hedge clippers, lawn mowers, chain saws, etc. Attacks frequently occur when a person is mowing the lawn or pruning shrubs and inadvertently strikes a nest. o If you encounter a swarm, run as quickly as you can in a straight line away from the bees. Do not flail or swing your arms at them, as this may further annoy them. Get to the closest house or car as quickly as possible. Don’t worry if a few bees become trapped in your home. If several bees follow you into your car, drive about a quarter of a mile and le the bees out. o Because bees target the head and eyes, cover your head as much as you can without slowing your escape. o Avoid excessive motion when near a colony. Bees are much more likely to respond to an object in motion than a stationary one. o Don’t pen, tie or tether animals near bee hives or nests and never attempt to remove a nest yourself. Find a reputable pest control company that specializes in bee removal. Check with your local cooperative extension office or the State Department of Agriculture &Consumer Services for trained and licensed pest control operators in your area. · Get indoors as quickly as possible. If you aren’t near a building, get inside the nearest car or shed. Close the doors and windows to keep the bees from following you. · If no shelter is available, keep running. African honey bees can follow you for as far as a quarter of a mile. If you run far enough, you should be able to lose them. · Don’t swat at the bees or wave your arms to fend them off. That will only confirm that you are indeed a threat. You’re likely to be stung even more. · Don’t jump into a pool or other body of water to avoid the bees. They can and will wait for you to surface, and will sting you as soon as you do. You can’t hold your breath long enough to wait them out, trust me. · If someone else is being stung by killer bees and cannot run away, cover them with anything you can find. Do what you can to quickly cover any exposed skin or susceptible areas of their body, and then run for help as fast as you can. · Once you are in a safe place, use a blunt object to scrape any stingers out of your skin. When an African honey bee stings, the stinger is pulled from its abdomen along with the venom sac, which can keep pumping venom into your body. The sooner you remove the stingers, the less venom will enter your system. · If you were stung just once or a few times, treat the stings as you would regular bee stings and carefully monitor yourself for any unusual reactions. Wash the sting sites with soap and water to avoid infections. Use ice packs to reduce swelling and pain. Of course, if you are allergic to bee venom, seek medical attention immediately. · If you suffered multiple stings, seek medical attention immediately. Symptoms vary from local reactions of pain, redness at the sting site, and formation of a wheal (raised bump usually pale in color). Localized itching is common and redness in the first 24 hours can become as large as 12 to 18 inches in diameter. These reactions are initially scary promoting people to seek medical attention. Children less than 10 years old and the elderly older than 70 have less severe reactions than younger adults. If Stung, What do I do? If you are stung by a honey bee, one of the most important things to do is not to panic. Panic by the person stung or those around him/her can produce a systemic reaction in itself. Many people believe they are allergic to honey bees when in fact they are experiencing symptoms of a normal reaction. Only a very limited portion of the population (one or two out of 1000) is allergic or hypersensitive to bee or wasp stings. The average person can safely tolerate 10 stings per pound of body weight. This means that although 500 stings could kill a child, the average adult could withstand more than 1100 stings. Most deaths caused by multiple stings have occurred in elderly individuals who may have had poor cardiopulmonary functioning. If stung by a honey bee, the first thing you should do is remove the stinger. The end of a sting is barbed and will remain stuck in the skin even if the bee is removed. Muscles in the stinger allow it to continue pumping venom into the victim, even if it is no longer connected to the bee, for up to a minute or until the stinger is removed. The sooner the stinger is removed, the less venom will enter the wound. Honey bees are able to sting only once and eventually die after they have released their stinger. Do not pull the stinger out with your fingers or tweezers because this will squeeze out more venom. Instead, scrape the stinger out with your fingernail, the edge of a credit card, a dull knife blade, or other straight edged object. Two kinds of reactions are usually associated with bee stings and those of other stinging insects as well: (1) local or (2) systemic, allergic, or life-threatening. A local reaction is usually characterized by pain, swelling, redness, itching, and a wheal surrounding the wound made by the stinging apparatus. Swelling can sometimes be sever. For instance, if stung on the finger, the arm may be swollen even up to the elbow. Swelling such as this is fairly common, even though it may be alarming. However, a more serious allergic reaction may be indicated if other parts of the body besides the general area in which the sting occurred begin to swell. For example, if stung on the left hand and the right hand or neck shows swelling you should seek medical attention immediately. Normal swelling may last up to a few days. During the days following a stinging incident, the wound may itch. 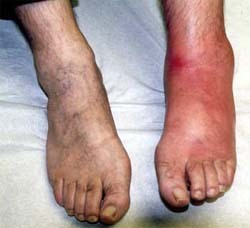 How to alleviate the sting: Swelling may be reduced by icing the wound and/or taking an antihistamine such as Benadryl. Topical solutions such as calamine may also help to alleviate pain associated with stinging. It is beneficial to drink plenty of water. Swelling that is not in the general area of the sting site, especially in the throat, neck, or tongue. Shortness of breath or difficulty in swallowing. If you experience any of these symptoms, seek emergency medical assistance immediately. Symptoms can begin immediately following the sting or up to 30 minutes later and might last for hours. Anaphylaxis, or the inability to breath, will occur within seconds or minutes of a sting. Anaphylaxis, if treated in time, usually can be reversed by epinephrine (adrenaline) injected into the body. Individuals who are aware that they are allergic to stings should carry epinephrine in either a normal syringe (sting kit) or an auto-injector (Epi-Pen) whenever they think they might encounter stinging insects. Epinephrine is obtainable only by prescription from a physician. Diphenhydramne (Benadryl) should be given to decrease minimal allergic reactions. In addition to Benadryl, it has been shown that Cimetadine (Tagamet) and H2 blocker can also help decrease the allergic response. 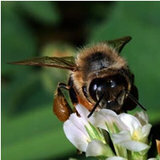 First found in southern Texas in 1990, Africanized honey bees are now found in much of the South. 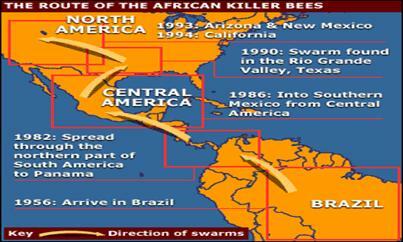 A map below shows the progress of the bees. 1. STAY AWAY FROM ALL HONEY BEE SWARMS AND COLONIES. 2. GET AWAY FROM BEES AS QUICKLY AS POSSIBLE. 3. WHILE RUNNING AWAY PROTECT YOUR FACE AND EYES AS MUCH AS POSSIBLE. 4. TAKE SHELTER IN AN ENCLOSED AREA SUCH AS A CAR, TRUCK OR BUILDING. 5. CALL A LOCAL BEEKEEPER, PEST CONTROL COMPANY, OR LOCAL COOPERATIVE EXTENSION AGENT FOR ASSISTANCE. 6. DO NOT HIDE IN WATER OR THICK BRUSH. 7. DO NOT STAND STILL AND SWAT AT BEES; RAPID MOVEMENTS WILL CAUSE THEM TO STING. 1. GET AWAY FROM BEES AS QUICKLY AS POSSIBLE. GO TO A SAFE AREA AWAY FROM THE BEES SUCH AS INSIDE A CAR, TRUCK OR BUILDING. 2. PULL OR SCRAPE STINGS FROM SKIN AS SOON AS POSSIBLE. MOST VENOM IS RELEASED WITHIN 1 MINUTE. 3. WASH STUNG AREAS WITH SOAP AND WATER LIKE ANY OTHER WOUND TO PREVENT INFECTION. 4. APPLY ICE TO RELIEVE PAIN AND SWELLING. – IF ALLERGIC TO BEE STINGS. To keep bees away, wear light-colored clothing and avoid scented soaps and perfumes. Don’t leave food, drinks, and garbage out uncovered. Do you know how to reduce your risks of being stung by a bee or other stinging insect? Let’s see how well you do on this quiz. To reduce the risk of being stung, you should avoid bananas and banana-scented toiletries. The face is the most likely place for a bee or wasp to sting. When a bee stings, it releases a chemical that alerts other bees to attack. If you’re being attacked and you can’t get indoors, you’re better off in a shaded area than an open area. All the answers are TRUE. Information provided by the ASSE, Safety X Change and USDA. For more information, visit the U.S. Department of Agriculture’s Agricultural Research Service at www.ars.usda.gov/Research/docs.htm?docid=11059&page=3.